This is a brand new thread for everything to do with the Arctic as well as Antarctica. I hope that many forum members will contribute on here. I have been a keen weather enthusiast for well over 50 years and have developed widespread interests in many meteorological topics. I have always been particularly fascinated by the Arctic and how it interacts with global climate patterns. 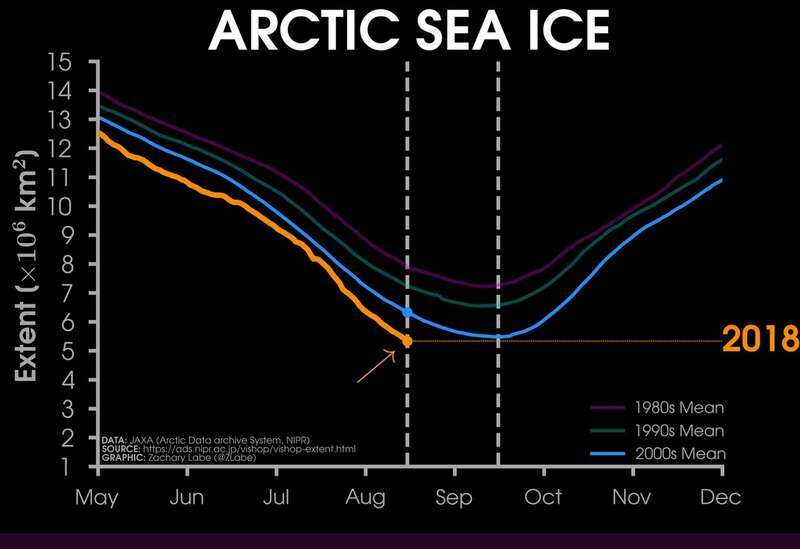 We have seen a worrying decline in Arctic sea ice extent during the last 30 years and the Arctic has become the centre of the global warming and climate change debate. Whilst this is undoubtedly highly influenced by human activities, there are also some longer term natural changes in play too. I always like to examine the facts and not be overly influenced by exaggerated reports at either end of the debate which has become highly political. Arctic sea ice extent - current and historic levels, rates of change, ice melt and refreezing, ice loss, ice age (new and older ice), comparisons and analysis with regular updates. Antarctica sea ice extent - as above plus features on the ice shelves and the differences between the two polar regions, facts and figures. Arctic and Antarticaa Sea surface temperatures - current, historic, trends, anomalies, reasons for changes. Arctic and Antarctica air temperatures, monitoring at certain sites, records, changes, data sets. Northern Hemisphere snow cover - seasonal changes, yearly and longer term variations, influences on regional climate and weather patterns. The Greenland ice cap - long term and current research, measurements, trends, rates of change. Glaciers - facts and figures, which ones are declining, which ones are growing, rates of change, global net ice loss. The Polar Vortex - how does this influence the Arctic climate? How does Arctic warming and ice loss influence the polar vortex? North America climate focus - how and when changes in the Arctic impact on the higher and middle latitudes (I often produce European and UK focused reports on a UK weather forum). Historic climates, research into Ice Ages and inter-glacial warmer periods. Climate change and its influence on the Arctic and Antarctica, how much, how fast, why? Global Warming Debate - assessing the extent of human impacts, separating the facts from the fiction, taking a "balanced" approach. Sudden Stratospheric Warming - impacts on the Arctic, what happens, how fast, why? The Arctic oscillation and the Antarctic oscillation - current, forecast, anomalies and historic values, links to weather patterns. I will add to this list as this thread evolves. In general I would like this thread to appeal to as wide an audience as possible. I'm a great believer in keeping things simple and explaining topics in plain English. I regularly post on the "Teleconnections" thread and some of the more complex subjects such as how does the Arctic ice loss teleconnecton interact with other teleconnections may be more suitable for that thread (or perhaps both threads). There are already some excellent papers and video presentations relating to the Arctic in the "Teleconnections Research Portal" and we will be adding a lot more as winter approaches. Some of these papers may be reviewed on this thread especially when they relate to a particular post. This list will gradually evolve in line with the thread (so work in progress). If you have a link that you feel is relevant, please draw this to my attentions by "replying to topic" or with a "personal message". Here's a direct link to the Teleconnections Research Portal - we have placed many Arctic related papers and presentations in there with many more being added during the coming months. National Snow and Ice Data Center (NSIDC): https://nsidc.org/arcticseaicenews/ - daily ice cover updates and monthly reports. Arctic Sea Ice graphs: https://sites.google.com/site/arcticseaicegraphs/ - this huge site with many sub links provides any extraordinary amount current and historic ice data, charts and maps. NOAA National Weather Centre Environmental Modelling Centre Global Sea Surface Temperatures and Anomaly Maps: http://polar.ncep.noaa.gov/sst/ophi/ (click on the map for any region). NOAA Snow Cover Maps: https://www.ncdc.noaa.gov/snow-and-ice/snow-cover/ - current, historic and animated snow cover maps for Northern Hemisphere, North America and Eurasia. NCEP 2m Surface Temperature Anomalies by region: http://www.karstenhaustein.com/climate.php - includes forecast, current and past charts with extensive Arctic and Antarctica coverage. NASA WorldView Satellite Imagery: https://worldview.earthdata.nasa.gov/ - with many options and tools to create your own world or regional images. Polar Science Center: http://psc.apl.uw.edu/ - packed with Arctic news, research, data and links to conferences and papers (some of these are already in the Research Portal and more to add). Zachary (Zach) Labe: http://sites.uci.edu/zlabe/ - a Ph.D. student, Dept of Earth System Science, University of California; fascinating Arctic research, reports, data, charts and links to papers. Climate Reanalyzer: https://climatereanalyzer.org/wx/DailySummary/#t2 - for current weather data and analysis (northern hemisphere). I show an Arctic map (below) to identify the locations of all the seas that make up the Arctic Ocean so that we can comment more meaningfully on the local variations in our posts on this thread. I will kick things off with a series of short posts to give a flavour of what might follow. I'll do one on the current Arctic sea ice extent later today and two more tomorrow on Arctic sea surface temperatures and Northern Hemisphere snow cover. If I have time, I will do another one on Arctic air temperatures and also show that report on the Arctic ash cloud spreading from those Siberian forest fires. When I return from a business trip, I'll add several more posts later next week. The chart (above) shows the current overall sea ice extent over the whole Arctic region. The orange line is the median and shows the edge of the ice cover averaged over the 30 year period from 1981 to 2010. The ice extent reached it's winter maximum on 17th March, 2018 and has declined steadily since during the Spring/Summer melt season. The average sea ice extent for July 2018 was 8.22 million square kilometers or 3.20 million square miles. I'll compared 2018 to earlier years in a minute. The sea ice concentration map gives us a good clue of where imminent melting is mostly likely. The white shades represent continuous ice cover and the middle to lighter blue shades are areas with more than 50% ice cover but with areas of open water in between. The middle to darker shades of blue are areas with below 50% ice cover. The very dark blue shades are areas with less than 15% ice cover and are mostly open water. These areas likely to be almost completely ice free within a few weeks and thru September which usually sees the minimum ice extent prior to the start of the re-freeze in the fall. The rate of melting is related to prevailing wind patterns (with stronger winds from warmer sources leading to a faster melt), sea surface temperatures (which I'll cover in my next post tomorrow) and cloud amounts (the albedo effect of white ice reflecting sunshine, is stronger under clear skies and can reduce the melt rate). These and other local influences can lead to wide variations from year to year and in different parts of the Arctic and we can examine many of these in later posts. This chart shows the anomalies in ice concentration for July 2018 compared to the 30 year mean July values (1981 to 2010). The blue shades are negative anomalies and the red are positive anomalies. So the large area of dark blues show that the ice concentration is run at 50% or more below its mean for this time of the year. The total anomaly of 1.1 million square km is shown at the bottom of the chart. The light grey circle around the North Pole is not imaged by the satellite. There are only minor areas with positive anomalies with the largest in the east Hudson Bay. Ice usually melts there about 1 month later than on the edges of the main sea ice sheet due to it being surrounded by land. The melt this Spring was particularly late due to the prolonged colder than average conditions up there caused, at least in part, by the February sudden stratospheric warming (much more on that SSW event on the teleconnections thread). This graph "can" be misleading as it looks like 2018 (the blue line) is second worst only to 2012 but 2012 (the dotted line) is shown separately as it was the record low year by the end of the melt season in mid-September. While 2018 is running way below the 1981 to 2010 30 year mean it "was", until last month, running quite close to the decadal mean and around 5th worst. The next chart puts this into context. This chart compares 2018 to the last 4 years as well as the record low year of 2012. During April and May, 2018 was running close to lowest on record but the melt rate slowed during June and early July, mostly due to well below average air temperatures at that time. During the second half of July 2018 melting accelerated again and 2018 is now roughly equal second worse with both 2017 and 2016. Let's look at the early part of 2018. In January and February, 2018 was running at the lowest levels of ice build up on record, sometimes trading places with 2017. A late recovery during March saw 2018 just avoid the all time low with ice extent marginally higher than in 2016 and 2017. The last 3 years ran neck and neck during April as the Spring melt began (see previous for May onwards). This chart shows the ice extent anomalies for each July from 1979 to 2018 compared to the 30 year mean (1981 to 2010). Allowing for year to year variations the trend is substantially downwards. (I'll do another post in a few weeks time looking at much longer term and historical ice levels). This chart was last updated in March 2018 (I could not find a more current one) but it still serves its purpose. It shows the age of the ice. While fresh ice forms or reforms during every winter half of the year, most or all of this "new" ice melts during the summer half of the year. The more permanent ice can be many years old. The chart shows the ice "age" for 1, 2, 3, 4 and 5+ years. It compares the 2018 ice to that of 1984 for the same period (week 9 or early March). The red shows the 5 year old or greater ice extent. In chart (a) in 1984 there was a large expanse of older ice but there is practically no older ice now - just a tiny amount hugging the north Greenland northern Canadian islands coasts. The bottom left chart (c) shows how this trend has continued for the whole 34 year period. 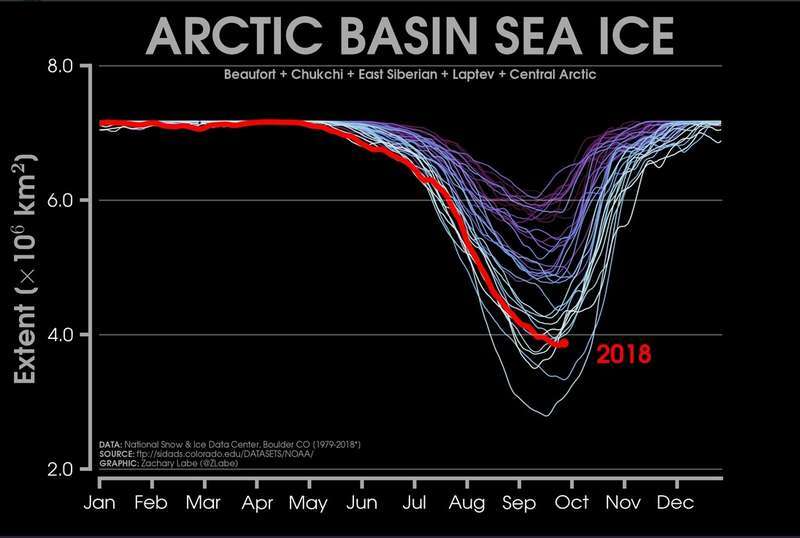 Most of the 5+ and the 4+ year ice has disappeared and the less than 1 year old ice has increased at the expense of the old ice. The volume of 2 and 3 year old ice has remained pretty constant but if this trend continues, once there is practically no 5+ year old ice remaining then ice with ages of successively shorter years will melt faster. The loss of this more permanent ice is even more serious than the overall ice loss as new ice is much thinner and melts much more quickly. The current NSIDC report has a special feature on the Beaufort Sea (please refer to the Arctic map in my introductory post to this thread). This part of the Arctic on the Canadian side used to have some of the oldest remaining ice. "Ice concentration over much of the Beaufort Sea has rapidly declined over the past couple of weeks. July 27 imagery from the Moderate Resolution Imaging Spectroradiometer (MODIS) sensor on the NASA Terra satellite showed a large off-shore region with broken-up ice and small ice floes vulnerable to rapid melt by the surrounding ocean (Figure 4a). Sea ice concentration data provided by the University of Bremen from the higher resolution Japan Aerospace Exploration Agency (JAXA) Advance Microwave Scanning Radiometer 2 (AMSR2) showed an expanding open water area within the ice pack between mid-July and August 1 (Figure 4b). By August 1, substantial open water was found throughout the Beaufort. On the other hand, near the coast to the east of Utqiaġvik (formerly Barrow), more compact and likely thicker ice remains, which is less likely to rapidly melt away. How much of the Beaufort ice cover survives the summer and how much more melts away will depend considerably on the weather conditions over the next four to six weeks." Right that's enough for now. I'll do an Arctic sea surface temperature update tomorrow and, if I have time, another post on Northern Hemisphere snow cover. I have spent many long Winter evenings going through the vast amounts of data on the excellent NOAA site, the sub-sites and their archive records. For this report, I have accessed part of their "Environmental Modelling Center and Analysis Branch" on this link:﻿ http://polar.ncep.noaa.gov/sst/ophi/ This takes you to their SSTs page. These are divided into current analysis and anomaly charts. The top chart on their site shows current global SSTs. You just click on any part of that chart to find the regional charts. The second chart shows current global SST anomalies with the same regional chart access. I show the current Arctic charts below. The critical level of SSTs for ice formation is at or below the -1.5c threshold (the bluish/purple colour on the map). In calm conditions, sea water will usually start to freeze when it is below -2c but that is for normal salinity. There is slightly lower salt content in the Arctic (mainly due to snow and ice melt) and the threshold is nearer to -1.5c. The sub -1.5c area is punctuated with a few spots with higher SSTs, even very close to the North Pole. There are some areas with SSTs well above freezing between Svalbarrd (the island group about 500 miles east of the north-eastern coast of Greenland) and off the north-west Scandinavian coast as well as around Iceland. To put this into context we need to examine the anomalies char. The SST anomaly chart shows that there is a wide area of open water in the Arctic with well above average surface temperatures (the white sea areas are still at least partly ice covered and not open water (see the ice extent charts in my previous post). That area around and south of Svalbard has current anomalies widely over 4c above average (the dark brown colours) and over 8c above in several places (the olive green colours). Even with a warming Arctic and extensively above average SSTs over many parts of the globe, these are truly exceptional anomalies. These are partly a long term legacy of the 2015-16 winter when the Atlantic jet stream powered almost continuously well into the Arctic for much of the first half of that Winter during the peak of the "super El Nino" episode. This shifted much warmer than average currents right up to the edge of the main ice sheet. This strong anomaly has persisted for 3 years and shows little sign of reversing. Unless the SSTs reduce substantially, the anomalies will be carried through this summer and into a fourth winter. This summer the jet stream has generally taken a more northerly track than usual. While this allowed those widespread heatwave conditions to persist over large parts of the middle latitudes, it has also pushed yet more warmer waters into the Arctic Ocean. There is a far greater influence on the North Atlantic side of the Arctic which is much more open and exposed compared to the more land locked North Pacific side. These warmer waters are occurring despite much of the Arctic having relatively cooler than average air temperatures (which I'll cover in another post later today). There is a small area of the North Atlantic, mostly southwest of Iceland and off the southern tip of Greenland with a negative anomaly (the green shades). Thank you for starting this dedicated Thread David. What's happening in the Arctic has enormous implications for global weather and climate going forward, with plenty of evidence that we are already seeing the impact of ice loss. I intend to be a regular contributor to this thread. 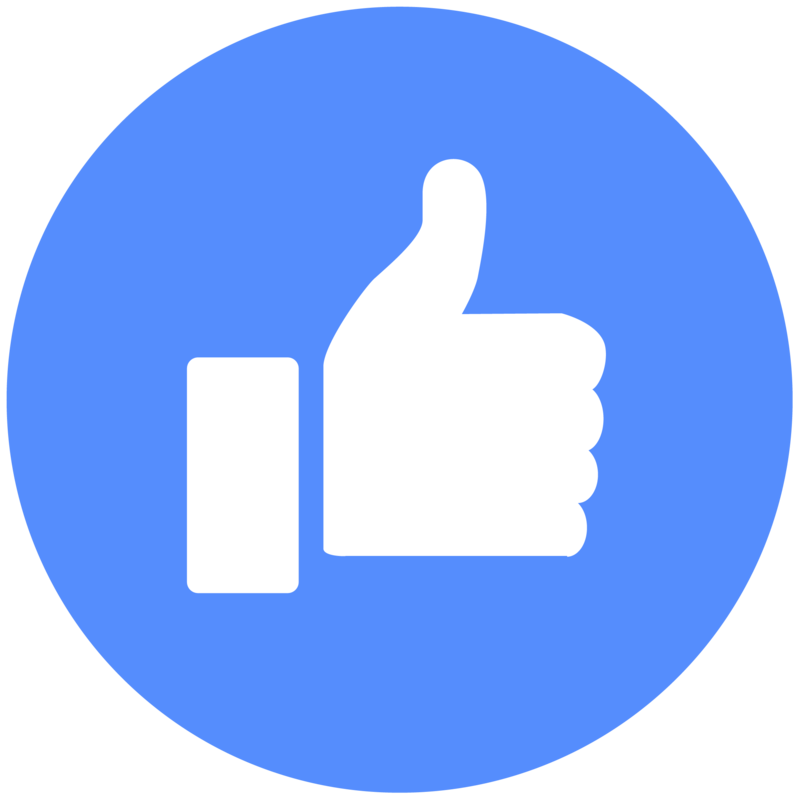 Thank you for your kind comments Malcolm and welcome to this exciting new thread. I'll look forward to all your future contributions and that's a fascinating first post you've done. 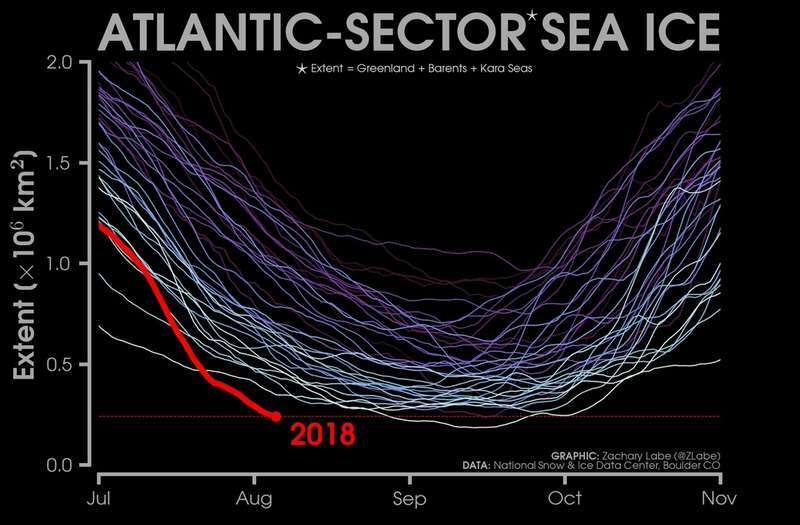 Yes, the Atlantic side of the Arctic as well as the Beaufort Sea on the Canadian side (that I alluded to) are losing ice even more rapidly this year and older is ice is thinning at a really worrying rate. We can closely monitor the remainder of the summer melt season on this thread. Let's hope for an early re-freeze in the fall but I'm not at all optimistic about that. These are 0200 GMT 2m surface temperatures, so closer to the daily minimum values. Almost all the Arctic is above 0c and only the Greenland plateau and ice sheet are substantially below freezing point (I'll show mean temperature in a minute). The Climate Reanalyzer site base most of their research analysis and charts on GFS output but as I'm looking for current (or historic) data and not predictions, the choice of model is not important here - just a clear representation. Here's a link to their site: https://climatereanalyzer.org/wx/DailySummary/#t2 Their range of output is listed on the left of each chart or map and the one shown is highlighted in red. The one above shows the "average" current 2m surface temperatures with a focus on North America and the Arctic - ideal for this forum! Almost all of the Arctic is currently seeing above average 2m surface temperatures with the regional average of +1c which is considerably higher than the global anomaly and the northern hemisphere anomaly. Parts of Greenland and the Siberian side of the Arctic have much higher anomalies of up to a mammouth 10c above average! Only parts of Alaska and Iceland (which is having one of its coolest summers on record) have negative anomalies. Overall. Arctic surface temperatures this summer have not been quite as high as in recent summers but they are still well above the 30 year means (more on this later on). Unsurprisingly, the distribution of the upper (850) temperatures are fairly similar to the near surface temperatures. The 850 positive anomalies are highest over the North Pole and Greenland and the negative anomalies are lowest over Alaska, Siberia and also over north-west Russia, north-east Scandinavia and Iceland. In my UK forum Arctic reports, I focused on a particular site to look at temperatures, means and anomalies in more detail and to monitor them in each update (at least monthly and more frequently in mid winter). I shall continue with this feature on this thread. I look at readings from Svalbard, the most northerly island group on the Atlantic side of the Arctic (more details in a minute). When you see what I show below, perhaps several other members might like to provide a monitor for some other Arctic weather stations. For US members, we could do with at least one Alaskan regular reading, perhaps one from north-east Canada, northern Greenland (which will feature a lot on this thread) and northern Siberia and/or, north-west Russia. Svalbard is roughly midway between the northern Norway coast and the North Pole and the islands are only about 600 miles from the pole. The group of islands range from 74N to 81N and from 10E to 35E. They were discovered by "Scandinavians" in the 12th century and Norse men gave the islands the name of Svalbard which means "cold shores". The Dutch mapped the group in the 17th and 18th centuries and named them Spitsburgen and this remains the name of the largest island but in 1925 when Norway took administrative ownership (previously unclaimed by any country) they officially named the group as Svalbard. The capital is Longyearbyen. Please note that the links above will update automatically at frequent intervals throughout the day. They are the Norway met office’s predictions. We need to be aware that these are only a forecast that is subject to change and I am told that the Arctic surface temperature forecasts are not completely reliable even at quite short range. The red bars show the daily maximum and minimum temperatures and the red line represents the daily average temperature. The black line represents the 30 year mean (1980 to 2010) or average mid point between the minimum and maximum temperatures. Note that the average temperatures were continuously above the mean and, for more than half the period, even the minimum temperatures were above the 30 year mean! The blue bars show precipitation. This chart shows us similar information but for 13 months. Instead of bars the daily temperatures are shown on lines. The blue colour is when the temperature falls below 0c. Again note that even the minimum temperatures rarely dropped below the 30 year mean. 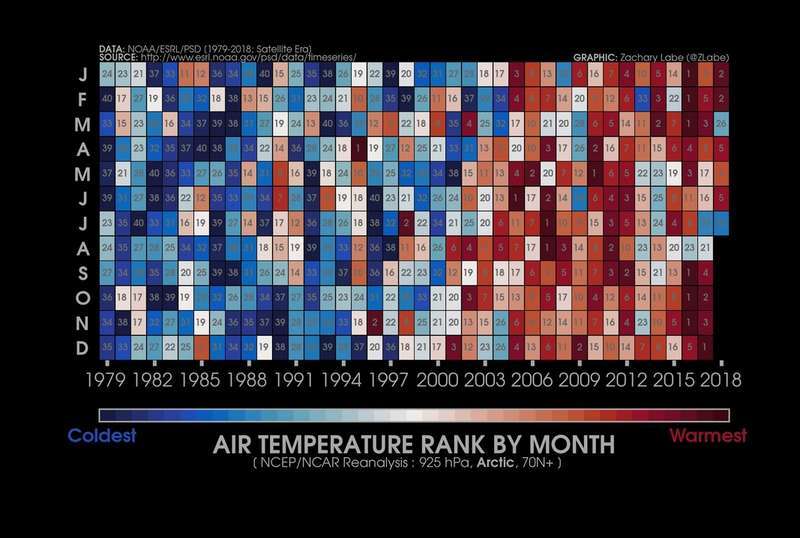 This last table shows the average temperature for each month, then the normal temperature (monthly means) and the highest and lowest temperatures for each month and the date that it occurred on. This has just been updated with the July 2018 figures when the monthly average temperatures were 1.3c above the 30 year mean. Note that this excess is actually the lowest monthly amount for any of the last 12 months but July 2017 was slightly less warm and saw a 1c excess. The largest excesses occur in mid winter with over 10c above average in February 2018. Svalbard has been seeing average temperatures often running at 3c to 8c above their long term average throughout most of the last 5 years. This is reflective of the warming Arctic and the near record low sea ice cover. Overall, the temperature profile for the whole of the Arctic is extremely worrying. The second lowest ice-build up on record last winter, getting close to the lowest levels on record during the 2018 melt season, older permanent ice thinning and melting and record high sea surface temperatures with the anomalies going even higher in some parts. We need to examine longer term trends and discuss all the causes. The US members on this forum will be only too well aware of the major forest fires in California and Colorado during this summer. Many of us that follow global news will be aware of the devastating fires last month in Greece. In the last week or so Spain and particularly Portugal have seen close to record high temperatures with some major fires there. Sweden has seen drought conditions and heat which sparked off the biggest fires ever seen there. Even here in the UK, we had major fires on our north western hills with heathland covered in drying out peat bogs (peat is highly combustible and is actually used as a fuel). These fires have been almost impossible to put out as the peat smoulders underground..
Now, how many of us have read about the huge forest fires in Siberia and what widespread impacts they have had? The smoke plumes from northern Siberia actually reached as far as Canada, the Great Lakes and New England in northern USA! It's that milky blue/grey layer below all the clouds. A few Canadians reported a burning smell. Much closer to the source region and en route to Canada was the Arctic. These images from the NASA Moderate Resolution Imaging Spectroradiometer (MODIS) sensor show the Arctic Ocean and surrounding land from July 3 to 6, 2018. Blue arrows indicate smoke that had drifted from fires in Siberia. "Fires in the western United States have been much in the news lately. Less noted are significant fires in Siberia. Over several days at the beginning of July, smoke from these fires was brought into the Arctic Ocean by winds associated with the pattern of low pressure in the region. The smoke streamed over the East Siberian, Chukchi, and Beaufort Seas and eventually across Alaska into northern Canada. The smoke has two potential effects on sea ice. First, as it drifts over the ice, the smoke particles scatter solar radiation and reduce how much is received at the surface. This has a cooling effect that will tend to reduce the rate of ice loss. However, smoke particles that settle onto the ice will darken the surface, thus decreasing the reflectivity of the surface, or albedo. This increases the amount of solar energy absorbed by the ice and enhances melt. The atmospheric scattering effect of the smoke is short term and dissipates after the smoke drifts away. The surface albedo effect has a longer-term impact and could serve to enhance melt rates through the summer. The magnitude of the effect will depend on how many smoke particles are deposited on the surface, the albedo of the surface that the particles fall on, and the amount of cloud cover which reduces the incoming sunlight. The biggest effect would be on bright, snow-covered ice. It would be smaller on darker melting ice and melt ponds, and there would be no effect in open water areas." The Siberian fires started as far back as early May following months of drought conditions and then a series of lightning strikes from dry thunderstorms. Some of them are still burning strongly now. The smoke plumes have travelled over 5,000 miles. Winds have varied but the Arctic is still in danger. As NSIDC say, smoke can blot out the sun and actually lower air temperatures but ash fall out can darken surfaces and reduce the albedo effect - the ability of white /bright snow to reflect sunlight. So let's look at the albedo effect a little more closely. This excellent charts shows that clear snow and ice reflects about 90% of solar energy straight back into space. Open water, on the other hand, absorbs about 94% of solar energy. This compounds the effect of ice loss. Various tests have demonstrated that darkened snow cover, such as snow covered in ash deposits will reflect less than 50% of solar energy and the darker it is the lower the reflective properties or the albedo effect. So, if we didn't have enough trouble with near record levels of ice loss in the Arctic, the last thing we need are major forest fires and what little ice and snow that remains being darkened by ash fall out. Unfortunately, if climate change is largely to blame, we can expect more drought conditions and heat waves and yet more frequent and extensive forest fires. A nasty vicious circle. We can explore this and a lot more on this thread. This is at the same time last year. Note that although it is very similar, there was a little residual snow cover over small parts of Asia (ignoring the higher mountain ranges which maintain permanent snow cover). The Asian heat wave in the middle latitudes this summer has melted snow up to quite high levels. Another great chart from Zack Labe showing the decreasing volume of sea ice each year in the three decades since the advent of satellite monitoring. While this is essentially an "Arctic" thread, I feel that we should monitor conditions in Antarctica too as well as Greenland and global glaciers (if no one else has in the meantime, I may well do a report on the latter two within a week or two). We shall be examining global impacts and climate change and there are significant geographical differences between the two polar regions and they contribute to the global climate in rather different ways. In this report I shall look at the current conditions in Antarctica. Then I'll consider some of the facts and identify some of the contrasts between the two regions. I shall also review a relevant learning guide fact sheet that I placed into the Research Portal. For a physical map of Antarctica, please refer to the one I placed in my introductory post as a permanent reference point. Sea ice surrounding Antarctica usually reaches its maximum annual extent between late August and mid September depending on weather types and patterns - so we are not far off this year's maximum now. Overall sea ice build up has been quite close to the long term mean. Much of western Antarctica is slightly above average while much of eastern Antarctica is slightly below average with a few larger positive and negative variations. Sea ice concentration distribution is quite similar to the overall extent and mostly at 70% to 100% (ie: little or no open water) except close to the edges). The variations of sea ice concentration are far greater in the Arctic (comparing times of maximum ice build up). Unlike the Arctic which retains sea ice throughout the year, albeit at worryingly reduced rates, Antarctica loses the majority of its sea ice each summer (more on that later). The chart above was around the time of the summer minimum which usually occurs between late February and early March. Interestingly, the greatest anomalies (with the lowest ice remaining) were adjacent to western Antarctica and yet this area has seen the strongest re-freeze this winter! Sea ice build up has been running at a slightly higher level compared to 2017 and is only slightly below the 1981 to 2010 mean. Year to year variations are much smaller than in the Arctic and the winter re-freezes have not been declining. In another post (and perhaps some other members will comment on it too), we need to examine the land ice, the ice shelves, snow cover and snow and ice depth and the weather patterns around Antarctica. There are conflicting studies on the overall ice extent across all of Antarctica - not least because it's so thick in places (over 3 km) and difficult to measure. Climate change and warming seas are producing much greater snowfall, especially so in the previously much drier east. This has in turn accelerated the glacial flows with snow and ice on the high plateaus (which cover much of the Antarctica landmass) spreading out coastwards and this is why more ice shelves have been breaking off in recent years. I follow the Antarctic Survey work and I'll do a separate post in due course on their valuable and fascinating research and findings. This thread is the place for all of us to get stuck into this! This charts shows how little annual (maximum) ice extent anomalies have changed since 1980 - perhaps a shade lower in 2016 and 2017 but above average from 2012 to 2015. No strong downward trend at all compared to the Arctic as I demonstrated in my Arctic Report (1). I'll show the excellent NOAA charts that I used in my Arctic Report (2). At first sight these SST charts show far less detail compared to the SST charts that we're used to viewing elsewhere, including those for the Arctic. Remember that we are at the height of Antarctica's winter. The white represents land and sea ice. The mauve is open sea (or where ice concentration is below 15%) and where SSTs are below -1.5c. In my Arctic report (2) SSTs post I said this: "The critical level of SSTs for ice formation is at or below the -1.5c threshold (the bluish/purple colour on the map). In calm conditions, sea water will usually start to freeze when it is below -2c but that is for normal salinity. There is slightly lower salt content in the Arctic (mainly due to snow and ice melt) and the threshold is nearer to -1.5c". The seas surrounding Antarctica are completely exposed and the circulation is much stronger than around the more landlocked Arctic and winds generally blow harder (eg: "The Roaring Forties"). There is sea ice melt, land ice (ice shelves) breaking off and ice/snow transported to the coast from well inland which reduces the salinity slightly but this is counteracted by the circulation and winds. The net effect is that the freezing level for Antarctic sea ice to form is nearer -2c and at least 0.5c lower than that required for Arctic ice to freeze. There are practically no areas of water with SSTs above 0c except near the extremities. Conversely, the strong circulation around Antarctica also protects it from other global patterns and Antarctica is less susceptible to the changes from surrounding areas compared to the landlocked Arctic which can be strongly influenced by land extremes, eg: that Siberian smoke plume I posted on or the jet stream pumping in warmer waters from the Atlantic. There are so many fascinating differences for us to get our heads around. Moving on to the anomaly chart, again in the depth of winter we see that open water and areas with up to 15% sea ice concentration (compare this with the ice concentration chart above) show practically no anomaly. Further out, in stark contrast to the Arctic, the SST anomalies are mostly below or well below average - from -.0.25c to -.2.25c with only minor patches of above average SSTs. It'll be fascinating to monitor how these Antarctica SSTs change during the summer melt season. We also need to look into recent trends and compare the Antarctic Ocean to global SSTs and circulation patterns. There are many links from there and overall, there is a wealth of information and I'm sure that we'll be making frequent references to this in our posts on here. I want to do a post on ice shelves before too long. Ice bergs are both dangerous and fascinating. That huge Arctic ice berg that dwarfed a small inhabited Canadian Arctic island made the news several months ago but that is small fish compared to the vast ice bergs and ice shelves that are regularly carved out in Antarctica. Is Antarctic sea ice important, too? Is it shrinking? 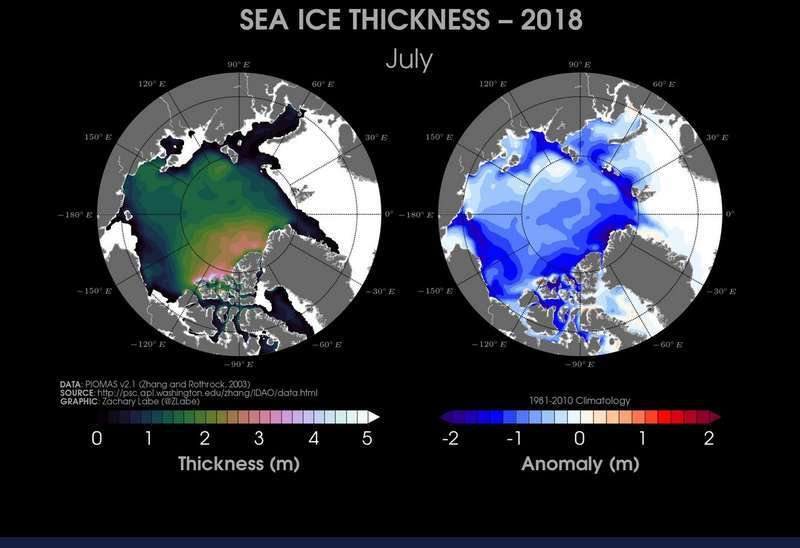 Scientists monitor both Arctic and Antarctic sea ice, but Arctic sea ice is more significant to understanding global climate because much more Arctic ice remains through the summer months, reflecting sunlight and cooling the planet. Sea ice near the Antarctic Peninsula, south of the tip of South America, has recently experienced a significant decline. The rest of Antarctica has experienced a small increase in Antarctic sea ice. Antarctica and the Arctic are reacting differently to climate change partly because of geographical differences. Antarctica is a continent surrounded by water, while the Arctic is an ocean surrounded by land. Wind and ocean currents around Antarctica isolate the continent from global weather patterns, keeping it cold. In contrast, the Arctic Ocean is intimately linked with the climate systems around it, making it more sensitive to changes in climate. That is very much in line with my earlier comments but I would slightly take issue with one point that NSIDC make. I feel that the changes in Antarctica are at least as important as those going on in the Arctic - yes they are very different and contribute to global weather circulations and patterns very differently. We might need to learn a lot more about the Arctic and climate change but scientists are still well behind the curve when it comes to understanding the changes and influences from Antarctica. I strongly believe in "balance" and I hope that we can all review and comment on these topics on this thread in a search for the actual facts and causes. I have many more papers and presentations to place into the Research Portal (some excellent ones are in there already - just go through the index where there are a number of Arctic and an Antarctica heading). Everyone is welcome to review any relevant paper on here. If you find some good ones that are not already in the portal, I'll happily add these - just provide the link and the details (full instructions are set out in the "Interactive Area" of the Research Portal - again just click on the title for a direct link). He describes the AAO (Antarctic Oscillation) also known as the SAM (Southern Annular Mode). I was particularly fascinated by the Antarctic Sudden Stratospheric Warming (SSW) event of 2002 - so far the only SSW ever recorded in the southern hemisphere. Well here's another very interesting chart produced by Zach Labe. A great way of looking at how Arctic air temperatures have been steadily increasing during the satellite era (since 1979). There seems to have been a notable 'flip' as we entered the 2000's. Worrying. Arctic sea ice usually reaches its minimum around early/mid September. But this year (August 16th) it's already below the minimums from the 1980, 1990, and 2000 decadal averages. 2012 is also shown a that saw the record lowest ice extent. With 3 to 4 weeks to go until the usual minimum extent, just where will we end up - perhaps the second worst on record? January 1981 - 14.9 million square kilometers. January 2018 - 13.1 million square kilometers. July 1981 - 10.3 million square kilometers. July 2018 - 8.2 million square kilometers. "Approaching Autumn, Pace Slows - After declining rapidly through July, sea ice extent decline slowed during the first two weeks of August. A new record September minimum is highly unlikely. Our 2018 projection for the sea ice minimum extent falls between the fourth and ninth lowest in the 40-year satellite record. Two NSIDC scientists are studying ice and ocean conditions in the western Arctic aboard an icebreaker. As of August 15, Arctic sea ice extent was 5.7 million square kilometers (2.2 million square miles). This is 1.58 million square kilometers (610,000 square miles) below the 1981 to 2010 average, but 868,000 square kilometers (335,000 square miles) above the record low at this time of year recorded in 2012. Ice retreated recently in the Kara, Laptev, and Beaufort Seas. The ice edge was relatively unchanged near Greenland and Svalbard, and in the East Siberian Sea. Much of the Northwest Passage through Canada remains choked with ice. The Northern Sea Route appears open, according to the Multisensor Analyzed Sea Ice Extent (MASIE) analysis, though ice is lingering near the coast in the East Siberian Sea. Scattered ice floes are likely present along the route. A large patch of sea ice, separated from the main pack, persists in the southern Beaufort Sea. Such patterns of ragged patchiness or large polynyas have been a more frequent feature of Arctic summers since 2006. Through the first two weeks of August, ice extent declined at approximately 65,000 square kilometers (25,100 square miles) per day, slightly faster than the 1981 to 2010 average of 57,000 square kilometers (22,000 square miles) per day. Sea level pressure was above average over the central Arctic Ocean, a change from last month, flanked by areas of below-average pressure in the Kara Sea and northern Canada. Temperatures at 925 hPa (about 2,500 feet altitude) were generally 1 to 5 degrees Celsius (2 to 9 degrees Fahrenheit) above average over much of the Arctic Ocean for this period, with the area just north of Greenland reaching 5 to 7 degrees Celsius (9 to 13 degrees Fahrenheit) above average. Below average air temperatures persisted over the Kara Sea, 1 to 3 degrees Celsius (2 to 5 degrees Fahrenheit), and the Beaufort Sea, 1 to 5 degrees Celsius (2 to 9 degrees Fahrenheit). Another feature of note is the region of open water along the north coast of Greenland, around Cape Morris Jesup, which is visible on August 13 in Moderate Resolution Imaging Spectroradiometer (MODIS) Terra true color imagery from NASA WorldView. The region normally consists of thick, consolidated ice from a general pattern of on-shore ice motion. Even when winds blow offshore, the strength of the thick ice would hold in place along the coast. However, current ice conditions appear more broken up and likely thinner, and over the past couple of weeks, offshore winds have succeeded in pushing ice off of the coast." This shows a true color composite image of Cape Morris Jesup off of northern Greenland, taken by the Moderate Resolution Imaging Spectroradiometer (MODIS) sensor on the NASA Terra satellite on August 13, 2018. NASA WorldView site link: https://worldview.earthdata.nasa.gov/ One can play around with the options and the tools there for ages for any world image. So, in terms of the last few years' minimum ice extent, this is marginally better news with the melt not quite as extreme as was predicted right up to last month. For those interested in the different seas and the references made to them, please look at the Arctic Ocean map that I placed in my introductory post to this thread. That open water off the north coast of Greenland is very disturbing and the thinning of the previously thick multi year ice in the Beaufort Sea slightly further northwest (referred to in my first Arctic report) is equally worrying. This chart compares the 2018 ice extent to the previous 4 years + the record low extent year of 2012. The slowing of the melt rate since late July is quite clear with only 2014 having more ice. All these recent years, however, are well below the 1981-2010 30 year mean (more on this shortly). "A simple way to project the upcoming annual minimum extent involves using the daily rates of change from previous years and applying them to the current sea ice extent. Following the 2005 to 2017 average rate of change between August 15 and the minimum, the extent is projected to drop to an annual low of 4.55 million square kilometers (1.76 million square miles), with a standard deviation range of 4.32 to 4.78 million square kilometers (1.67 to 1.85 million square miles). If sea ice extent continues at the rate of ice loss seen in 2008, the fastest recorded, the minimum at the end of summer would be 4.20 million square kilometers (1.62 million square miles), or the fourth lowest minimum in the satellite record. If sea ice extent continues with the rate for ice loss from 2006, the slowest recorded, the minimum would be 4.90 million square kilometers (1.89 million square miles), or the ninth lowest in the satellite record. It is possible that the rate of change through the remaining summer will be unprecedented in the satellite record (either faster or slower), yielding a final minimum extent outside of this range, but our estimates provide a window of the most likely minimum extent this year. Another possibility is that winds will consolidate the ice and reduce the overall extent. This was a factor contributing to the record low recorded in 2012." So let's compare some of those highlighted years above by examining the March and September ice extent charts for each of those years (roughly the maximum and minimum ice extent levels for each year) and also go back much further. The satellite records that are reproduced by NSIDC started in 1979, so I'll cover some of those years initially and then use other records to go back further. 2016 had the second lowest ice minimum extent on record. Starting from quite close to the "decadal" average maximum in March, 2016 (with widespread local variations above and below average) 2016 saw the most rapid Spring ice melt on record and was running below the 2012 level up until July. 2012 saw by far the lowest minimum ice extent on record. Surprisingly, it started off with a maximum ice extent in March which was very close to the 1981-2010 30 year mean (the pink line in the chart) with above average ice extent in many parts cancelled out by well below average extent in the Barents and Kara Seas - something that we've seen become a standard feature of recent Arctic winters and can be focused on in another post in the coming weeks. 2012 only started running at the lowest ever extent from the beginning of July and saw amazingly rapid melting during July and August with additional melting right thru September. This was at least partly due to unusual weather patterns and again is something that we should examine much more closely on this thread as we need to understand which weather types and circulation patterns (+ any other factors) cause such rapid melting and which ones inhibit or slow down the melt rate. I'm including 2008 as NSIDC in that prediction chart for the 2018 minimum rate compare it to that year which for the mid August period to early September had (for that short period) the fastest ever melt rate on record. Nevertheless, 2012 still ended up much lower with much later date for its minimum ice extent. Now 2006, the year that saw the slowest ice melt from mid August to early September. It started off with slightly below average maximum extent in March (note: only slightly below in the Kara Sea) and ended up with slightly below average minimum extent. 1996 started with close to average maximum extent and following a very slow melt season ended up with one of the highest minimum extent in the satellite era second to 1980 - see below). Although 1995 started off with slightly above average maximum extent it ended up with the lowest minimum at that time (similar to 1990) until the modern era from 2005 onwards. 1990 was very similar to 1995. Note that Newfoundland was almost completely engulfed in ice in March - something that we haven't seen since then. That isolated ice shelf east of Greenland was an interesting feature, separated and well beyond the 30 year mean line. I wonder if it broke off from the main ice sheet, rather like some of the activity we now see in Antarctica. I'll investigate. 1983 saw the second highest maximum ice extent in the satellite era. 1980 saw the greatest "annual average" extent in the satellite era. The maximum extent was only just shy of the 1983 second highest level. The minimum extent was the highest between 1979 and 2018. 1979 was the first year of the continuous satellite recording era. It saw the highest maximum ice extent, ahead of 1983 and 1980 while the minimum extent was the fourth highest in the modern satellite era. There are sporadic earlier satellite records from the 1960s such as the Nimbus 1 images which had been lost but were rediscovered in 2013. There are several papers and articles related to this and I'll place them in the Research Portal within a week or two. I will then write a short post to review those papers on here. In general, we have to rely on other data, records and estimations for earlier years (more details on this later). We need to be very careful here as some charts are produced to exaggerate the falling trend and a few attempt to smooth out the trend - the opposite ends of the global warming debate. The decline in sea ice extent is worrying enough without distorting the facts and figures or using confusing axis points and scales on graphs. I'll attempt to show what I believe to be the more realistic ones but even these show quite a diversity of values. This chart shows the September (close to the annual minimum) ice extent from 1900 to 2016. In general terms the 1930s saw the lowest values in the 20th century until the late 1990s and were not that far above the 2000-2010 decade but well above the current decade. All the same, it does show that natural variability does produce quite significant changes and short term trends and also substantial year to year differences all of which we will need to examine on this thread. Minimum ice extent was much higher in the 1960s, with 1969 taking the record for the 20th century. My weather observing interests started in 1959. I read newspaper reports that the ice sheet in several 1960s winters practically reached the northern Iceland shores. In 1969 there were reports of ice bergs in the Norwegian and north North Sea and presenting shipping hazards down to the Scottish northern isles and several smaller ones being spotted off the northern mainland coast. These were truly exceptional conditions and probably the only example in the 20th century. Remember the Gulf Stream pushes warmer waters much further north in the eastern North Atlantic compared to the western North Atlantic. Just to illustrate the problems with reconstructing earlier records, this chart shows the 1930s with September ice extent not quite so low as in the previous chart. Part of the problem is identifying sea ice concentrations, above or below the 15% threshold (that is used in the modern satellite era), open water and solid ice. I will go into more detail on how earlier records were constructed in the next part of this post. This chart does not include the 2014 onwards period. What it does reveal clearly is that until the current decade that winter maximum extent has fallen at a smaller rate than summer minimum extent (ie: re-freezing in the winter months should restore much or all of the ice lost in the previous melt season). In fact ice extent minimum values were double the recent values between 1850 and 1930, then became more variable, rising to the 1960s peak with the falling trend beginning in the 1970s and accelerating since 2000. The maximum extent does not really start falling significantly until after 2000. The axis and scale used on this chart are really as all the charts "should" be - from 0 to 20 in this case. Until now, climate diagnostic applications, reanalyses, and atmospheric modeling studies that needed a lower boundary condition did not have an arctic-wide gridded ice concentration data set to use based on observations and one that extends back as far as the mid-nineteenth century. Gridded Monthly Sea Ice Extent and Concentration, 1850 Onward addresses this need by improving and extending the Arctic and Southern Ocean Sea Ice Concentrations product. It does this by adding newly available historical sources and by using the NOAA/NSIDC Climate Data Record of Passive Microwave Sea Ice Concentration for the satellite era. North Atlantic ice edge positions covering 1850 through 1978 derived from various sources, including newspapers, ship observations, aircraft observations, diaries, and more. Gridded ice concentration from regular aerial surveys of ice in the eastern arctic by the Arctic and Antarctic Research Institute, St. Petersburg, Russia, beginning in 1933. Ice edge positions for Newfoundland and the Canadian Maritime Region from observations over the period 1870 through 1962. Detailed charts of ice in the waters around Alaska for 1954 through 1978 called the The Dehn Collection of Arctic Sea Ice Charts, 1953-1986. Arctic-wide maps of ice cover from the Danish Meteorological Institute over 1901-1956. Whaling logbook entries noting ship position along with an indication of whether the ship was in the presence of ice. The six sources already existed as data compilations in one form or another prior to our use of them, and with the exception of the Canadian ice edge positions and the whaling logbook data, these are available from the National Snow and Ice Data Center. However, some data sets, such as the Dehn collection, required digitization and interpretation before the information could be used. The documentation for Gridded Monthly Sea Ice Extent and Concentration, 1850 Onwardprovides references for all sources and details how each was prepared for processing. The data product is a NetCDF file covering January 1850 through December 2013. It will be updated and extended in 2017. More information can be found in the July 2016 Geographical Review article cited below, and in a Cooperative Institute for Research in Environmental Sciences (CIRES) news article called Reconstructing Arctic History: Scientists build a new database to depict Arctic sea ice variations back to 1850. CIRES is a partnership of NOAA and CU-Boulder. The National Snow and Ice Data Center is part of CIRES. There are a great many red symbols, especially on the Atlantic side of the Arctic - the most important in terms of ice loss in recent years. By analysing the readings and plots of the ice sheet edges, the Institute was able to put together a highly accurate map of the ice extent for the whole of the Arctic. There were also many coastal observations around the periphery. Perhaps the only slightly weaker area was towards the Bering Straits on the far side. If anything, the old method was even more reliable in terms of measuring the extent of the thicker (longer term) ice. Satellite images are restricted in terms of an overall picture but struggle to accurately show the detail of the thickness and depth of ice and areas of slightly broken ice. The sensory equipment only gives a fairly approximate reading. There are, of course, specialist expeditions and surveys carried out and several ice breakers take ice depth readings every year. Overall, the old method provided a highly accurate measure of ice extent. The modern satellite era NSIDC charts show areas of the ocean with at least 15% sea ice extent. It is the permanent ice sheet extent which is most important and we should always make reference to sea ice concentration charts as well (as I did in my first Arctic report). Using the 1850 to 2012 graph (the previous chart above) I estimate that the September 1926 ice extent was about 8.25 million square kilometres. The current 15% ice extent is about 5.7 million square kilometres. I show the current sea ice concentration map below for a comparison. So to compare like with like, we should be looking at the 70% to 90% (+) ice concentrations - that's the pale blue and white shades. I would estimate that it is close to half of the total ice (15% +) concentrations shown. So that would be equivalent to (5.7m x 50%) just 2.85 million square kilometers and only about 35% of the amount in August 1926. Most of the ice sheet is well concentrated and I would say about 80% is in the 70% + concentration band. So that would be (12.6m x 80%) 10.08 million square kilometers or around 60% of the March 1926 level. Overall, although this is based on various estimates and approximations, I feel that my calculations do help to provide a reasonable comparison between current conditions and those from 1926. I wonder if we can obtain more records, maps, charts and data from the Danish Meteorological Institute archives or from other sources for many other pre 1979 years. Records of ships logs go back to the 18th century. This is one of those charts that uses a misleading axis and scale which exaggerates the trend. Yes, modern observations do show a very large and worrying falling trend and in fact, summer minimum extent levels have fallen much further since 2000 (below 4m in 2012 and nearer to 4.5m to 5m sq km in the last few summers) but to around 40% of the 1,450 year mean range (not falling to almost zero!). The reconstruction figures are mostly taken from ice core samples (and some ocean floor and other samples) and we must accept a high degree of approximation but the chart serves as a broad guide to the ice extent history. As you're planning a glacial ice extent post @Bring Back 1962-63 (David), I've posted this State of the Climate report here as well as in the Climate thread. The longest-running records of glacier mass balance (whether a glacier loses or gains mass over the course of a year) are kept by the World Glacier Monitoring Service (WGMS). The group tracks changes in 140 glaciers; just over three dozen of them qualify as climate reference glaciers, with records spanning more than 30 years. In 2017, 29 of the reference glaciers were surveyed — including those from Austria, Canada, China, France, Italy, Kazakhstan, Norway, Russia, Switzerland, and the United States — and all but three showed a negative mass balance. Mass losses were especially dramatic in the European Alps. “The cumulative mass balance loss from 1980 to 2016 is -19.9 meters, the equivalent of cutting a 22-meter-thick (72-foot-thick) slice off the top of the average glacier." 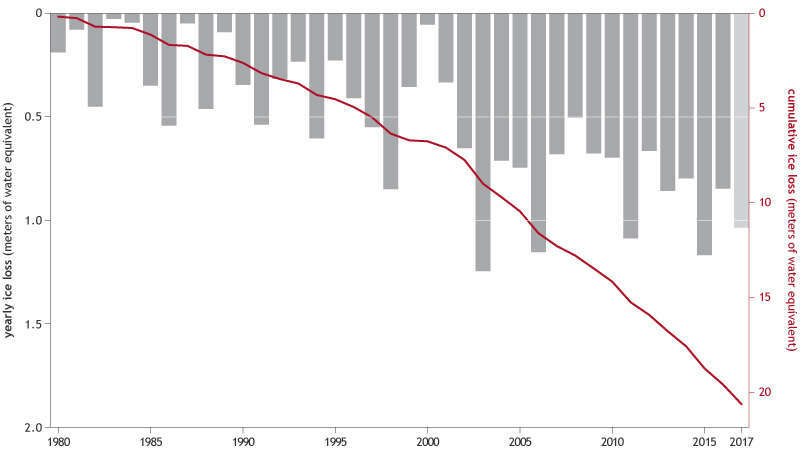 The graph below shows the mass balance of 37 reference glaciers each year since 1980 (bars), along with the total mass loss over time (red line). The Arctic Ocean is currently on a fast track toward seasonally ice-free conditions. Although most attention has been on the accelerating summer sea ice decline, large changes are also occurring in winter. This study assesses past, present, and possible future change in regional Northern Hemisphere sea ice extent throughout the year by examining sea ice concentration based on observations back to 1950, including the satellite record since 1979. At present, summer sea ice variability and change dominate in the perennial ice-covered Beaufort, Chukchi, East Siberian, Laptev, and Kara Seas, with the East Siberian Sea explaining the largest fraction of September ice loss (22%). Winter variability and change occur in the seasonally ice-covered seas farther south: the Barents Sea, Sea of Okhotsk, Greenland Sea, and Baffin Bay, with the Barents Sea carrying the largest fraction of loss in March (27%). The distinct regions of summer and winter sea ice variability and loss have generally been consistent since 1950, but appear at present to be in transformation as a result of the rapid ice loss in all seasons. As regions become seasonally ice free, future ice loss will be dominated by winter. The Kara Sea appears as the first currently perennial ice-covered sea to become ice free in September. 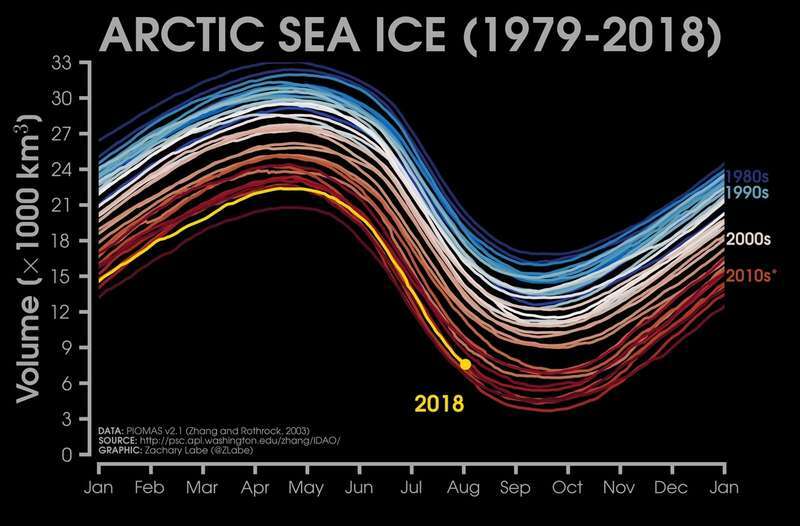 Remaining on currently observed trends, the Arctic shelf seas are estimated to become seasonally ice free in the 2020s, and the seasonally ice-covered seas farther south to become ice free year-round from the 2050s. Ice cover has not only retreated in its areal extent, it has also become much younger and thinner in recent years. In April 2018, only about 2% of the winter sea-ice cover consisted of sea ice older than 5 years, compared to almost 30% of the April sea-ice cover in 1984. Accelerated sea ice loss during all months of the year is additionally driven by a lengthening of the melt season. As assessed for the Arctic as a whole through April 2018, melt onset is occurring 3 days earlier per decade, and freeze-up is happening 7 days later per decade. Over the 40 year long satellite record, this amounts to a 12 day earlier melt onset and a 28 day later freeze-up. Extrapolating the linear relationships into the future, we find that the Arctic Ocean completely loses its ice cover throughout August and September for an additional roughly 800 ± 300 Gt of anthropogenic CO2 emissions. For an additional 1400 ± 300 Gt of anthropogenic CO2 emissions, we estimate the Arctic to become sea-ice free from July throughout October. Great thread guys, thanks for the info. I agree. I appreciate the time and energy that was invested in to this post so far. Thanks for providing the information in an easy to understand format. Sea ice extent is currently the third lowest on record for the inner Arctic Ocean basin. Each line is one year of @NSIDC daily data over the satellite era [purple (1979) to white (2017)]. 2018 is shown in red.